It's taken 46 years but the Aretha Franklin documentary 'Amazing Grace' is being released April 5, 2019. 'Amazing Grace' is a documentary presenting Aretha Franklin recording the most successful gospel album of all time. Amazing Grace is crafted from never before seen footage originally captured in 1972 of the live recording of the album at The New Bethel Baptist Church in Watts, Los Angeles in January 1972. When Franklin was planning her album, Warner Brothers agreed to film the session in 1972. Warner Communications, the parent company of Warner Brothers Films and the Warner, Reprise, Elektra and Atlantic labels, had reaped the rewards of that new buzz-word, “corporate synergy” with the success of the 1970 Michael Wadleigh film and album of Woodstock. Warner had paid $100,000 for the rights and the film grossed $17 million and the album sold three million copies. Warner Communications hoped for Amazing Grace to have that same success. Warner Brothers’ Director of Music Services, Joe Boyd (Nick Drake, Pink Floyd Producer), proposed hiring Jim Signorelli, a documentary filmmaker and his team of 16mm cameramen. However, before Signorelli’s deal could be signed, Warner Brothers’ CEO, Ted Ashley, mentioned the project during a meeting with Sydney Pollack. At the time, Pollack was recently nominated for an Academy Award for Best Director for his film, They Shoot Horses Don’t They. Pollack immediately signed up for the project upon hearing Franklin’s name. 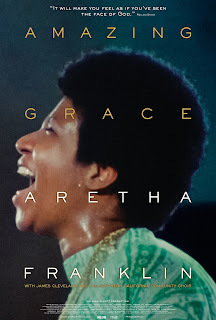 Recorded live at Rev James Cleveland’s church in Watts, California in front of a lively audience/congregation, Amazing Grace would become the highest selling album of Franklin’s career and the most popular Gospel album of all time. However, the film was never released publicly. Sydney Pollack was a feature-film director. When recording, sound is usually post-synched on the back-lot. After the remarkable two days of recording, the editors threw up their hands.+ There were no clappers, no marks to guide the sound into synch with the picture. Pollack hired lip readers and specialist editors but received no luck. The film languished for almost 40 years before former Atlantic staff producer/Wexler protégé Alan Elliott came to Wexler and ultimately to Pollack. Together, Elliott, Wexler, and Pollack approached Warner Brothers about using new digital technology to match sound to picture and make a film out of the raw footage.